I had some data on a Cruzer flash drive I wanted to protect, and I just discovered how easy it use to use BitLocker on a flash drive (thanks to Hanselman, who pointed this out in one sentence at the end of a post). BitLocker is another Windows 7 feature that has been around since Vista, but BitLocker To Go (encryption for removable drives) is new. I believe it is only available on Win7 Ultimate and Enterprise. Getting BitLocker To Go functionality to work on Windows XP and Windows Vista required some reengineering of the core BitLocker feature. To do this, the team refactored the method by which BitLocker protects FAT volumes. BitLocker behavior was modified to overlay a "discovery volume" onto the physical, original volume and virtualize the blocks overwritten. The discovery volume contains the BitLocker To Go Reader as well as a readme file. This is called a Hybrid BitLocker drive. 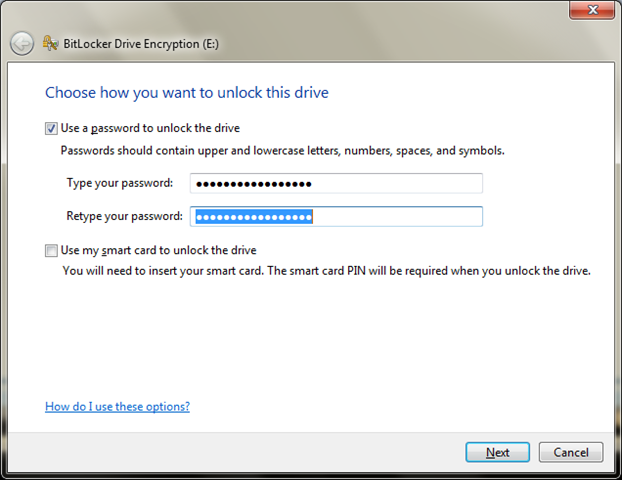 By default, when a FAT drive is encrypted, a hybrid BitLocker drive is created. The discovery drive is visible only on the Windows XP and Windows Vista operating systems. I always thought encrypting my entire system hard drive was a little bit scary. I like BitLocker To Go because it is built-in, and can protect a removable device where I keep sensitive files. 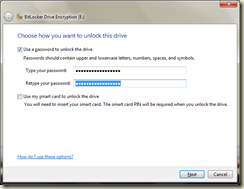 I like truecrypt, it works on any computer, not only on ultimate windows7. +1 for TrueCrypt. I've been used it for years and since they added full OS X and Linux support, I feel like I'll always be able to open my files when/where needed. TrueCrypt, there's no excuse to use anything different. It's secure and it's free, what more could you want? Tip: it seems that if you have a big codebase and you work with multiple working copies checked out simultaneously, you get much better performance if each working copy is on its own encrypted partition. One understands that humen's life is not cheap, nevertheless we require cash for different things and not every person earns enough money. Thence to get good mortgage loans and just secured loan will be good way out.